Variation is interesting. Why are there species, for example? Why do identical twins vary in life outcomes at all? How, and why, do the two antipodal maritime temperate regions of Eurasia, China and Europe, differ? The answers one comes up with vary by discipline and scope. In Farewell to Alms the economic historian Gregory Clark explains the genetic outcome of differences in lactase persistence (LP) as a function of variation in wealth; Europeans were wealthier so they could invest in the expensive production of milk and meat. I suspect most natural scientists would look to environmental constraints as the largest effect variables; LP arises in environments where cattle culture is more productive on a per area unit basis than grain culture. And then there is of course the fact that human lifestyles do not exist in a social and historical vacuum. There is evidence that wide swaths of the north China plain were abandoned by farmers during periods of political disorder due to their vulnerability to the depredations of nomadic groups (Genghis Khan's plan to depopulate the Yellow River plain and turn it into pasture was not as bizarre as one might think). When political stability returned there would be a shift in the boundary between nomad and farmer. If Peter Turchin is right then the variables effecting these changes are endogenous to a model of historical dynamics which are characterized by cycles (Turchin's case study of the expansion of Slavs and farming along the Ukrainian Cossack frontier is a classical case where politics rather than ecology served as the limiting reagent). 1) Climate. Zunhua was much colder in winter, with temperatures generally falling below zero. This surely dampened the local pathogen load. 2) Ecological differences. Zunhua is relatively mountainous, while Jiaxing is a coastal wetland region tamed into an expanse of intensive rice production. Irrigation is common in Jiaxing, but there were ecological constraints on its utilization in Zunhua (the soil is very sandy and so there are major issues with drainage which reduced the efficiency of canals). 3) Differences in diet. Zunhua's populace had a relatively diverse diet, where dry land agriculture was balanced with animal husbandry and hunting and gathering. In contrast, Jiaxing was a classic climax rice monoculture where almost all calories were from grain. 4) There were differences in ethnicity. 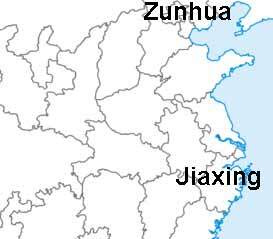 The local historical identity of non-Han peoples was far stronger in Zunhua than in Jiaxing. The process of Sinicization had proceeded to completion in Jiaxing, which now lay along the axis of the economic heartland of China. In contrast, Zunhua was for nearly 3,000 years on the northeast boundary of Han habitation. It was known to the ancient Chinese, and Han populations were generally extant within its territory, but it was often dominated culturally by non-Han groups who would play a large role without Chinese history, culminating in the Manchus. The author also notes that there was a large difference in the extent of female labor in Jiaxing and Zunhua. It was a prominent feature of the life of peasants in Jiaxing, but not so of Zunhua. Additionally, one bureaucrat observed that unlike many other parts of China it was not typical for very poor women in Zunhua to supplement their income with de facto prostitution (random "walks" in the fields). The inhabitants of Zunhua were consumers of a fair amount of meat, but interesting they were also milk drinkers, atypical for China. The Census data from 1820 to 1910 suggests that Zunhua was relatively underpopulated (the author's focus here is on observations hinged around the late Imperial Manchu dynasty). This probably explains the relative wealth of a the typical peasant in Zunhua vis-a-vis one in Jiaxing (as well as lack of epidemics). But why was Zunhua so underpopulated in the first place? Are the data from the late Imperial period just a transient which captures a snapshot before the region is caught in a Malthusian Trap? To some extent I suspect so, but, I wanted to note specifically that Zunhua was on the radar of Chinese annalists nearly 3,000 years ago. Unlike vast regions of far southern inland China it was not new to Sinicization, rather, Sinicization simply never completed itself over the ensuing centuries. In fact, the region was for long periods under barbarian rule and outside of China proper. First, I want to repeat one of the major obvious insights of The Retreat of the Elephants, the process of Sinicization was inevitable, a matter of time, across much of what is today China. The millet and rice based agricultural systems associated with Han Chinese swept away competing lifestyles before them like a deterministic physical system. A proactive program of cutting down forests and clearing land, as well as channeling and controlling the flow of running water across the landscape, was part and parcel of the expansion of the Chinese state and Han identity. Some of the increase in the numbers of the latter is surely a matter of demographics, as Chinese settlers push into cleared land. On the other hand, there is extensive documentary evidence that those non-Chinese tribes which adhered to lifestyles which were at variance with that of the Han on many occasions adopted the intensive farming lifestyle when their territories were impinged upon. Eventually they saw themselves as Han. In the Christian and Islamic world it was common to assert that war against those outside of the bounds of their religious civilization was by nature just because they were infidels, and that enslavement of unbelievers was acceptable. Some of the material in this book highlights a similar ideology on the part of the the Han Chinese through their perception that those who were not Han were fundamentally not human or subhuman. But, just as with Christianity or Islam, tribes and peoples could become Han. This process was one less of ideology, though certainly elites adopted Confucian ethics and the Chinese classics, as opposed to one characterized by a way of life in terms of the optimal mode of resource extraction and utilization. To be Han the commoners farmed like the Han, and the rulers ruled like the Han. The Han way of life was eminently successful in terms of extracting more productivity per unit are of land, as evidenced by the fact that China is now well over 90% Han, and, its historically high population density. It was not a rigid orthodoxy, the original millet based farming system which arose around the Yellow River plain gave way to the dominance of rice agriculture, likely originally a feature of the culture of non-Han populations of central and south China. The Han way of life was one of maximal resource extraction and mass mobilization of populations under the aegis of a central governing unit. The transition from Han to non-Han seems to have been partly due to demic and cultural diffusion as a bottom-up process, but, as documented in The Retreat of the Elephants, it was also a function of the greater robusticity of the war machines of Han states. Not only could they mobilize more men, but they could they could organize and coordinate their actions because of the central nature of their polities. Local peoples had an advantage in terms of their knowledge of regional conditions and could wage a persistent rearguard action over the centuries by disrupting the social and agriculture systems (e.g., canals, bridges, bureaucrats, etc.) which Han society depended upon, but over the long haul Sinicization marched on. The machine could be broken, but never utterly destroyed. So why did Zunhua resist Sinicization so long? I suspect that the prevalence of animal husbandry indicates that the Han agricultural complex was simply not as well suited to this region. In areas too dry for agriculture irrigation is an option, but as noted above it was not an ideal one in Zunhua because of the characteristics of the terrain and soils. During the Former Han dynasty the emperor Wu engaged in a series of wars with the nomadic Xiongnu, but a serious problem with defeating these peoples was that a Chinese victory did not result in cultural assimilation. There were instances where the nomads could not win, but they could never truly lose. In areas too dry, cold and rugged for Han agricultural techniques nomadic life simply was more economically more efficient, or, more accurately the only option aside from hunting and gathering. The final Chinese "victory" over the Xiongnu occurred via co-option from their within by dividing their elite and brandishing the allure of civilized luxury goods. To some extent there was little difference in the material conditions of the Xiongnu elite, instead of engaging in raids to obtain wealth they were bribed or paid by the Chinese polity. In terms of efficiency this reduced the uncertainty on the part of the Chinese and so was economically a good decision as it allowed for a shift toward lower time preference. Reading the chapter in question here, I got the feeling that the economic and social conditions in Zunhua mimicked the contrasts which one might draw between pre-modern Europe and China. Europeans had a more mixed diet than the Asian peasant, and their agricultural complex relied to a far greater extent on animal husbandry and cattle (or, differently stated, more inputs of capital than labor to increase marginal returns). The average European peasants was arguably wealthier than the average Chinese peasant. In Farewell to Alms Greg Clark points to better hygiene in East Asia leading to a different death schedule, so that the Chinese would be pushing against the Malthusian limit to a greater extent (fewer mouths dividing up a finite pie in Europe vs. China at any given time). On the other hand, economic historians such as Raymond Crotty have emphasized the peculiar ecology of Northern Europe, and the incentives that existed toward raising of cattle stock as opposed to cereal agriculture. From what I have read it seems clear that in places such as Scandinavia traditional cereal agriculture gave a relatively low in yield. After all, wheat is a crop of the Mediterranean. Oats were a better bet, but are relatively unpalatable to humans, so they were more effectively grown as fodder for cattle. A quick look at a world map will show that Europe is far to the north of China. Because of the disparate impact of Westerlies the different sides of continents at the same latitude may experience climatic regimes which vary a great deal. Northern California and New Jersey are an example. Distance from oceans also matter, southern Nebraska has a more "continental" climate than either New Jersey or northern California despite similar latitudes. It seems to me that on reason China and Europe took such radically different paths in terms of agriculture styles, in particular northern Europe and China, were differences in their ecological parameters. Europe is a very high latitude temperate zone characterized by moderation in its climate and relative regularity in its precipitation. China is a relatively low latitude temperate zone because of its exposure to the winter air of central Asia, as well as being subject to the reversal monsoonal flow during the summer, which is the season of greatest precipitation. The region of Europe at the similar latitude as north China, the Mediterranean zone, is characterized by much milder temperatures in winter as well as an inverted precipitation regime from Asia, with a maximum during the cold season of least sunlight. But in the case of Zunhua ecology is probably not the only constraint. Its local population in the ancient phase included many "friendly" Xiongnu, suggesting its proximity to the steppe heartland. The period which The Retreat of the Elephants surveys is one of relative peace when Zunhua was not on a political frontier, the Manchu dynasty had subjugated Mongolia, and pushed the north boundaries of the Chinese Empire past the Amur river. For much of Chinese history in contrast Zunhua was a borderland, often not under Chinese hegemony. It seems plausible that therefore Zunhua was often a "No Man's Land," and so not subject to economic exploitation because of the risks inherent. I suspect an analogy to arable regions of Ukraine which were long occupied by nomads may be made. Up until the expansion of the Czarist state during the 17th century farmers that lived in central and eastern Ukraine would be subject to brutal exploitation by nomadic peoples, a dynamic one can glean as far back as the Scythians. Only with the rise of the Gunpowder Empires were the nomads on the marchlands finally defeated and extinguished as a threatening wild card which dissuaded farmers from settling vast swaths of Inner Eurasia. To some extent this might be interpreted simply as a variant of Greg Clark's point about shifting the death schedule; during periods when Zunhua was on the borders only those who were willing to risk life and limb would settle there, and periodic wars would "clean out" the region demographically. Ultimately though I am curious as to why agriculture developed the way it did in China, being so focused on human labor. In The Great Divergence it is pointed out that China was more densely populated than India, and that land was more plentiful in South Asia. In Cows, Pigs, Wars, and Witches it is argued that cattle reverence in India is a function of the fact that bulls are an essential draft animal (the author notes that a disproportionate number of feral cattle are cows). In When Histories Collide Raymond Crotty argues that cattle reverence in India is due to the fact that killing calves would be counterproductive in terms of milk production. I have already provided some general rationales for why animal husbandry was relatively rational in Europe. In China, the primary animal was the pig. In terms of domesticates it seems that the pig is nearly feral, generally subsisting on offal. The pig can not produce milk, nor can it serve as a work animal. Various regions of Eurasia developed "critical mass" as complex literate societies during the pre-modern era, but gross features of their modes of production still differed. Why? Some ideas. Going off William H. McNeill's arguments in Plagues and Peoples, I suggest that South Asia had a higher pathogen load than East Asia, and so there was always downward pressure on the population so that it did not "push" against the Malthusian Trap to the same extent. This also freed up more land so that successful farmers might get a relatively larger marginal return from the utilization of cattle as draft animals. In Europe the variables were not disease related, but structural differences in climatic regimes. Northern Europe was well watered, but extremely cool and moist. It was not suited to the arid adapted grains from the temperate zone because of the latter parameter, but also not appropriate for rice agricultural because of the former (the Po river valley has rice now due to advanced irrigation techniques). Mediterranean Europe is subject to the peculiarities of its winter maxima precipitation regime. This allows for the cultivation of olives and other specialty crops, but, it also results in a situation where most of the rain falls during the season of least sunlight. The ecological differences between Europe and China had an agricultural/economic implication: the Chinese could maximize caloric output per unit area of land through pure cereal cultivation. In contrast, the Europeans could not maximize calorie output through cereal cultivation but had to engage in "mixed" agriculture. The caloric total extractable out of the land per unit area was lower when summing the complements which were produced in European agriculture, but, the balance of nutritional intakes (protein, vitamins, etc.) was superior. This resulted in naturally greater physiological fitness for Europeans than Chinese as well as a lower final population density, and also natural evolutionary changes such as LP to deal with specific nutritional intakes. Finally, I want to touch upon the general manner in which farming spread. It is quite clear that over the long term in China the Han way of life resulted in reduced lifetime physiological fitness. Nevertheless, it was above the threshold of fitness necessary for viability so that an individual could reproduce. Additionally during the transient when it was expanding into regions where land was in surplus it might actually have been a lifestyle that lead to relative affluence. The main problem is that this affluence was temporary as the population reached the local Malthusian limit. At this point the exhaustion of the local ecological base which might have supplemented the grain monoculture was beyond a point of no return and the society was "boxed in" to a lifestyle predicated on surviving through the next harvest. Additionally, judging by the fact that Han elites had surplus which they could use to bribe barbarian warlords the quantitative rise in the subjects from which to extract rents was sufficient to more than cancel out the qualitative decline in the character of the tax extracted. The Han way of life might have been misery for the peasantry, but there was a reasonable case that the Confucian bureaucratic fixation on a free peasant base as the ideal subject population was self-interested. Underfed farmers made quiescent subordinates. In contrast, nomads were notoriously factious, and their periodic organized eruptions were contingent upon coalescence around a particularly charismatic figure, or, more often the collapse of the Chinese political order and the opportunity for unparalleled plunder. Nevertheless, the fact that nomads were presences along the northern edge of Chinese civilization implies that there were ecological constraints on the spread of the Han lifestyle. Beyond the reach of dryland farming and irrigation there was no possibility of settlement. While nomads could always turn arable land into pasturage, the Han could not always turn pasturage into arable land.